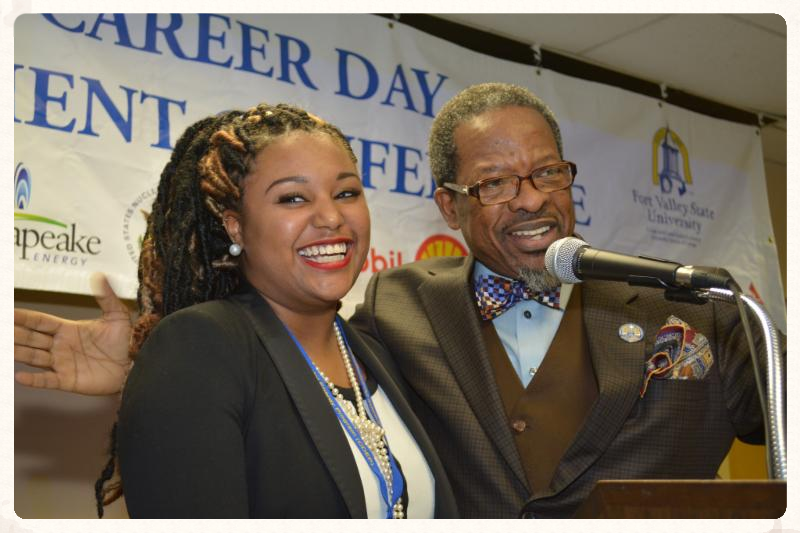 March 13, 2015 – Energy industry representatives and university officials traveled to Fort Valley State University’s campus to celebrate student scholars and academic excellence during the 32nd Annual Cooperative Developmental Energy Career Day and Luncheon on Feb. 23. The program, which receives corporate and federal funding, helps underrepresented groups and women receive education and training that will help them obtain careers in the energy industry. This year, corporations donated more than $488,000 to fund student scholarships and to keep the program going. During the luncheon program, students performed skits to teach executives about the program. Students sang along to Pharrell William’s “Happy” delivering facts about CDEP’s dual-degree 3+2 program, where participants attend FVSU for three years to earn a bachelor’s degree in a science or mathematics-related field, then transfer to a partner school to earn another one in an energy-related field. The program is sponsored by corporate donors and federal grants, and its founder, Dr. Isaac Crumbly, director of CDEP, has received commendations from U.S. Presidents Ronald Regan and Barack Obama. Crumbly says that the program has raised more than $30 million in funding for student scholarships. CDEP Scholar Ashley Davis, who serves president of the FVSU National Society of Black Engineers on campus, delivered a humorous introduction of FVSU president Ivelaw Lloyd Griffith. Davis sang along to music from Isaac Hayes’ Shaft, “Who’s the bow-tie wearing man who has a plan?” and three backup singers replied, “Griffith.” The student said like the fictional character of Shaft, Dr. Griffith was all about business. The performance left Griffith and the audience laughing. “I didn’t know I was Shaft,” he replied. “but that is a good thing.” Griffith thanked special guests including energy industry representatives and lawmakers for attending the luncheon. He quoted Seneca, a philosopher, statesman and dramatist. He told incoming CDEP scholars that they would need to embrace excellence when they entered campus. Griffith cited Aristotle’s famous quote, “We are what we repeatedly do. Excellence is not an act, but a habit.” He told students that they needed to practice excellence with integrity, not by cheating or cutting corners, but by reaching for the highest standard every time. “Pursue and practice excellence inside and outside the classrooms,” he said. “You can’t just practice it one day, you have to practice it all the time.” Griffith said, adding that he hoped that everyone at the event would continuing contributing with the intention of keeping the program going. GraduatingFVSU students were welcomed by their partner institutions during the event. Students received memorabilia from partner institutions that include Georgia Tech, University of Nevada-Las Vegas, University of Texas-Austin, Pennsylvania State University, University of Texas Pan Am and the University of Arkansas.“I look forward to this time every single year to meet the talent,” said Dr. Joanna Jezierska, a representative from the University of Nevada, Las Vegas. “How many times can you meet so many outstanding students.”Companies also presented big checks to keep the program going for another year. Here are a list of companies that donated at this year’s luncheon.